As I work on re-formatting the Celebrate the Rhythm of Life Living Curriculum Program, I'll be sharing with you some of the material from the program. That way, when you hear about the new format and special offer, I am hoping you'll say, "Yes please!" and join the Celebrate the Rhythm of Life community. My children were young when their dad and I separated sixteen years ago. One was seven years old and the other was a newborn. It's hard to go through separation and divorce with young children. With divorce come new relationships, some are long lasting and some are not. The sense of who is family and who is not can be fleeting. For several years after the divorce, my children were fortunate to have a "bonus mom" who served as a consistent, warm and loving person to guide them and care for them when they spent time with their dad. Among the many ways she warmed their hearts and inspired them was one that migrated over to my house and has stayed with us, to be shared with guests at our table. That is the gift of rose and thorns. Rose and Thorns: We can't have one without the other. At dinner, after the food is served, the candle is lit and the blessing has been said, we settle in a bit, taste the food, and then I announce that it is time for Rose and Thorns. If we have guests at our table I explain to them what it is, that we take turns sharing a little something from our day that was beautiful, sweet or beloved like a rose, and we also share something that was prickly, hard or challenging. Each person shares both a rose and thorn. If there is a singular event that we're all wanting to claim as our Rose, we might place that aside, and dig a little deeper into the less obvious. Same with the Thorn. Some days a person may not have a Thorn to share, that's just fine. Sometimes a person doesn't want to share, there's no pressure to join in. What I do notice as my children have grown older is that Rose and Thorns can spark conversation into topics that might not have come up. They help us see each other a little better, and they help us to feel compassionate towards each other, as we are reminded with the Thorns that each of us has challenging moments in our days. 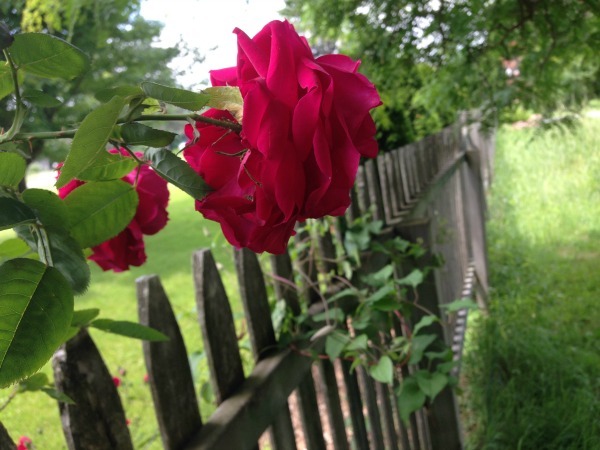 We began sharing our Rose and Thorns when my oldest was seven, school age, and that felt right age wise developmentally. We recently had a friend over for dinner, who upon coming over the next time for dinner asked if we were going to play that game again, about the Rose and Thorns. And so we did. My warmest thanks to the "bonus mom," for opening her heart and home to us, and for all the sweet rose goodness she has shared, as well as for providing a model of grace in meeting the prickly bits of life. The dinnertime Rose and Thorn tradition has nourished us and gone on to inspire many others.